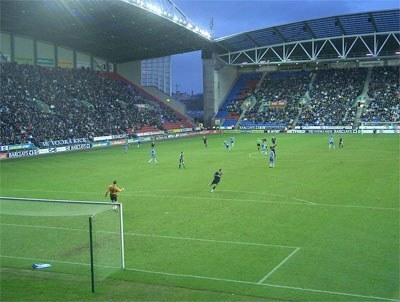 Wigan Athletic has been a member of the English Football League since 1978. Their best result, a tenth position in the top division, was achieved in 2006. Besides that, their biggest merit is the FA Cup victory in the 2012-13 season after beating Manchester City in the final. The JJB Stadium in 2005, before the name change to DW Stadium. When Wigan Athletic started its activity in 1932, which is relatively late for an English football club, had other local clubs as Wigan County, Wigan Town, Wigan United and Wigan Borough existed for a while.